Last month, at a dedication ceremony in Chattanooga, Tennessee, dignitaries flipped a giant light switch to signal the official opening of the “Volkswagen Chattanooga Solar Park”, built on Volkswagen’s compound. While we have the SEDA-regulated 20-year FIT power purchase agreement between power producers and TNB/SESB, Volkswagen Chattanooga and another private entity (Silicon Ranch) entered into 20-year power purchase agreement without involving the government or any of its agencies. This is a business agreement between two private entities. And for solar power purchase, this is remarkable! Chattanooga auto assembly plant is on the background. Volkswagen photo. 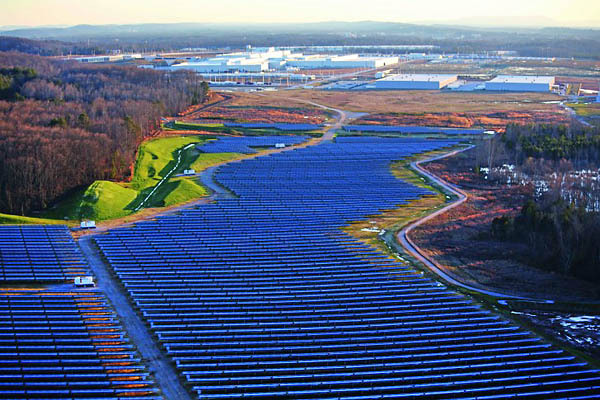 The automaker has begun using the 33,600 solar modules on a 33-acre solar farm adjacent to its manufacturing facility to power up to 12.5% of the plant’s needs during full production and 100% during non-production periods. VW’s embrace of solar power will reduce its operating costs over the long term. The solar installation at Volkswagen Chattanooga confirms the awarding of the highly-coveted LEED Platinum certification to VW by the U.S Green Building Council in late 2011. At that time, the Building Council called the Chattanooga manufacturing facility “the world’s greenest auto plant” and noted it was the first automotive manufacturing plant in the world to receive the top LEED certification. Today, the Chattanooga plant remains the only auto plant worldwide to earn the LEED Platinum certification. Volkswagen's Chattanooga Operations runs the first and only automotive plant worldwide that was awarded with the LEED (Leadership in Energy and Environmental Design) Platinum certification of the U.S. Green Buildings Council. Its new paint shop saves the use of 20,000 gallons of water per day by its innovate dry scrubber technology, while its water harvesting system provides about 6 million gallons of water annually for restrooms and cooling circuits in the body shop. The plant is certified according to ISO 14001 for its environmental management system and according to ISO 50001 for its energy management system. And now, it came up with its own 13 GWh/year green power source from the sun. I think it is very possible for, say, Cypark to work out means to supply one of the industrial areas, or plants (e.g. KK Industrial Park, Proton Assembly plant, etc) for similar Solar Farm development and operations. A 20-year agreement is very much feasible. Wow, it is huge. It's good they had so much land to have this solar park. Last week when i visited a nearby electronics shop,i was surprise that they are selling solar panels for home installation,where they will build a system depending on our reguirement. I read or perhaps watch somewhere that if you are using solar energy in America, the govt actually pays you when you have excess energy and channeled back to the power company..
@kitou - we have a better deal in Malaysia: if you generate electricity from solar, ALL the energy that you produced from your solar system will be purchased by the govt for RM1.40 per unit, minimum. Your installation is connected to TNB/SESB grid and they will be 'forced' to buy whatever amount you produce. @thomas - I wonder if the price tag of RM1,135 includes wiring kit, at least for DC supply? Or that's just for the 90W panel?